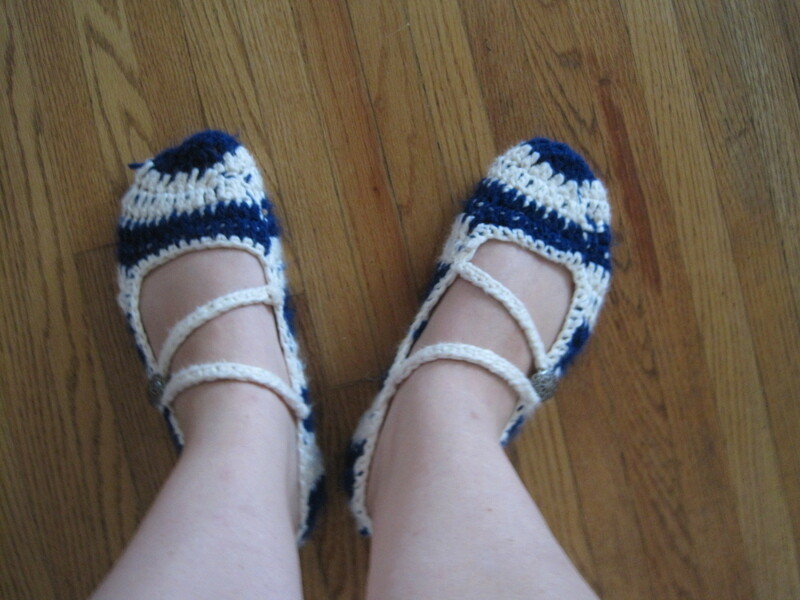 Easy, fast, crocheted slippers for you and friends! 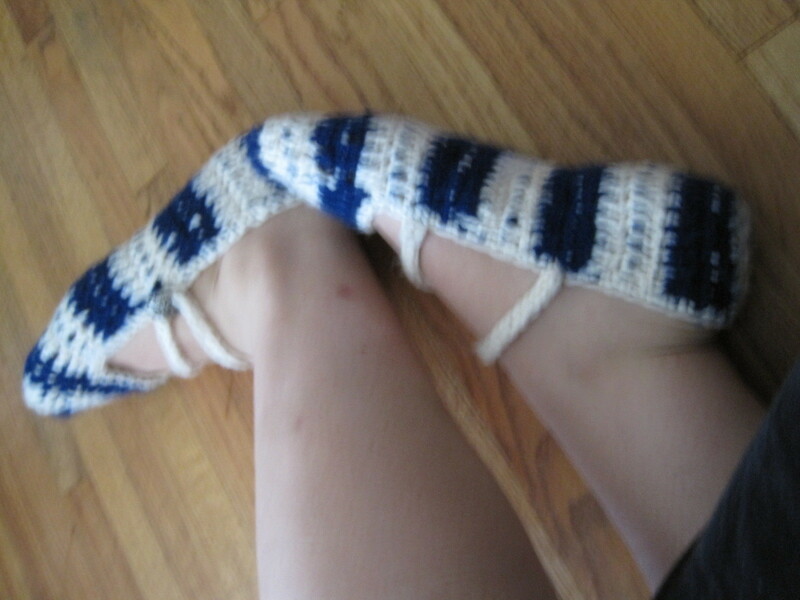 I'm posting it here because I have modified it a bit and looove it, so I want to share it with all of you :) I made a pair of these for myself, then made a pair for a friend as a gift. My mom saw them and wanted a pair, and when my coworkers saw my friends pair, they all wanted them too. At the moment, I've made 3 and have about 9 more to go LOL. For the blue/white pair (mine) I used a really soft blue acrylic and a silky-soft organic white cotton yarn. The blue/turquoise pair are totally acrylic and really soft. If you make yours with acrylic, the second they get a bit dirty, pop them in the washing machine. This is a GREAT project for remainder yarn, as it takes about 1/2 a skein per color for a pair. I love amigurumi, so heaven knows I have tons of barely used yarn. Also, the pattern is ridiculously easy. 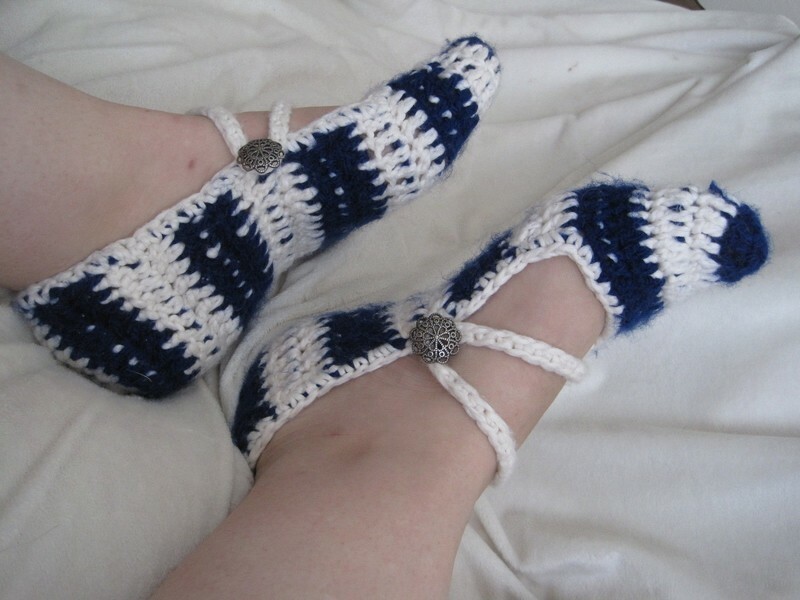 I crochet mine as I watch DVDs and shows :) You can make them in solid colors, thin stripes (one color for each round), thick stripes (2+ rounds for each color), with the v-strap as shown, a simple mary jane-style strap, make them higher (and thus strapless like I will for my arthritic grandmother)... basically, these are super customizable. I wear womens US size 11 shoes and make these with 19 rounds. Its really touch and go, since the tension of your crochet will determine the fit. If your making them for yourself, just put them on every few rounds. turn the slipper, it now is worked in rows. Rnd 8-19: Make one dc in each dc, turn. This is the trial and error part! If you have large or wide feet do 20 dc, if you have smaller feet, try making it with 15. Every few rows, slip your toes into the front of the slipper and see where the body lies. You want the end of the body to juuuust meet at the back of your heel. In my opinion, it is better to make them a little small, since they will probably stretch out! When you get to your last row, bind off, but do not cut off your tail! This is really easy! 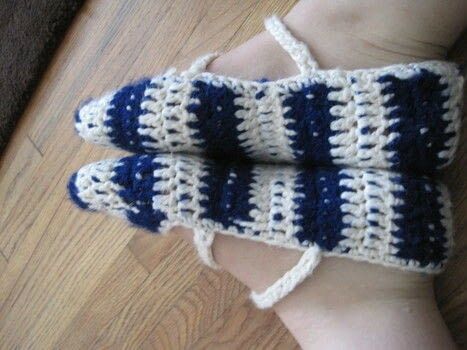 Fold the slipper in half so that the back edges meet. If you working with two colors, use the contrasting color to sl st down one side of the slipper, going through both sides. Cut your tail, but leave it long. Weave the tail back up the heel and knot yet again. Turn the slipper inside out so that the seam is on the inside. 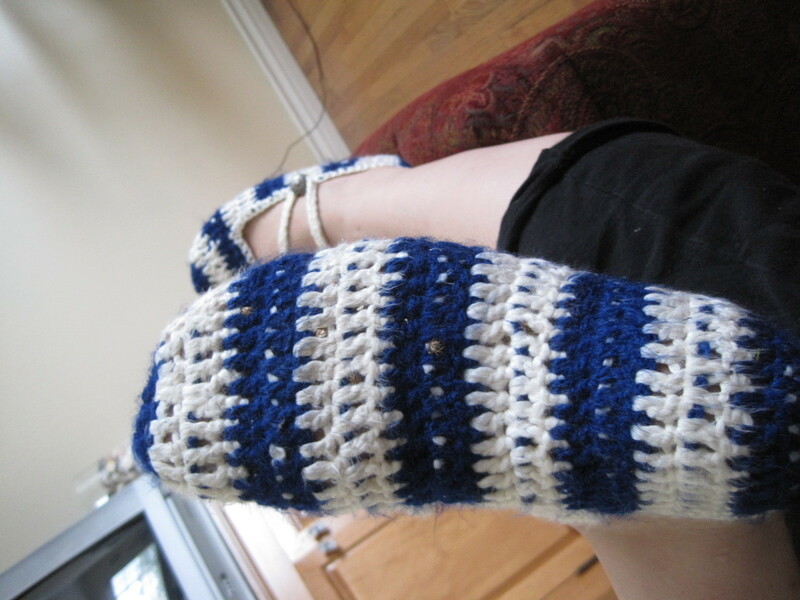 This makes the slipper look more finished and clean looking. It will also help the top to fit a bit snugger if you made your slippers too large. 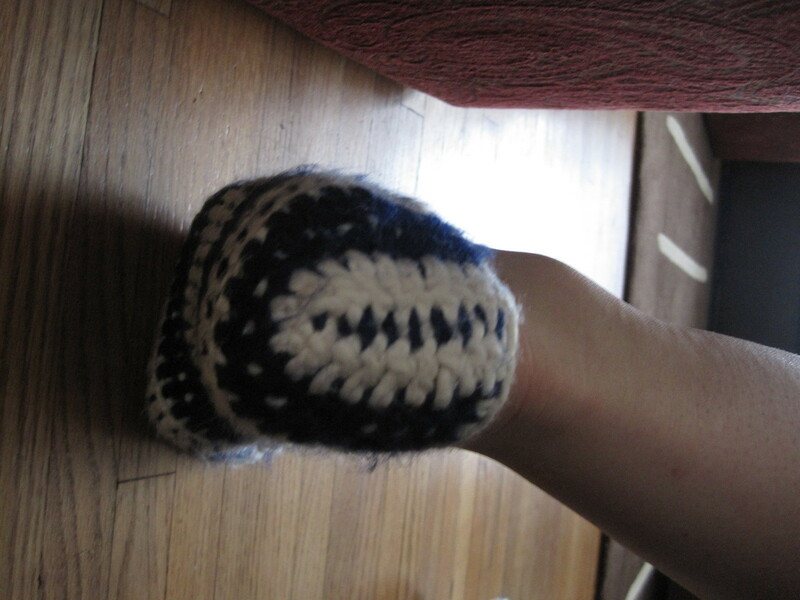 <--- Pictured is the slipper with the addition of the edging. Put the slipper on. Decide where you want the V to be and mark with pieces of yarn. Find buttons that you like, and secure them on the outside of the slipper. In one of the marked spot, ch 1 onto the edge of the slipper. Continue to make the ch until it is long enough to loop around the button and reach the other marked spot (mine is 35 ch). You want this to be snug. 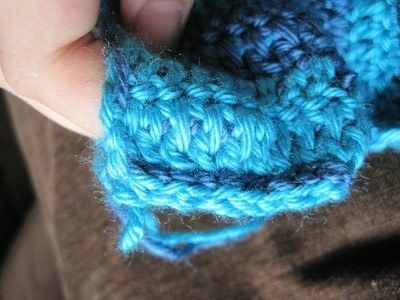 Turn, and crochet into the back loops of the stitches. Bind off. Secure the loose end to the other marked spot, and your done! 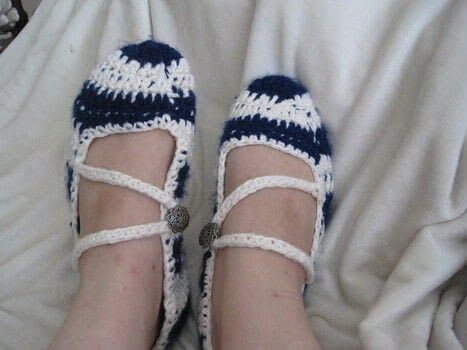 Enjoy your new slippers! I made theese for my niece. They are great, the easiest instructions so far! I'll get a pic up as soon as possible.